Now that winter is here, it’s time to add more layers to your daily wardrobe and start planning a cozy vacation by the fire inside some of the most stylish and cool cabins in the Bay Area. Better to plan your getaway sooner rather than later. Many of these choice abodes—ranging from pricey and affordable to amenity-heavy and bare-bones—fill up fast. 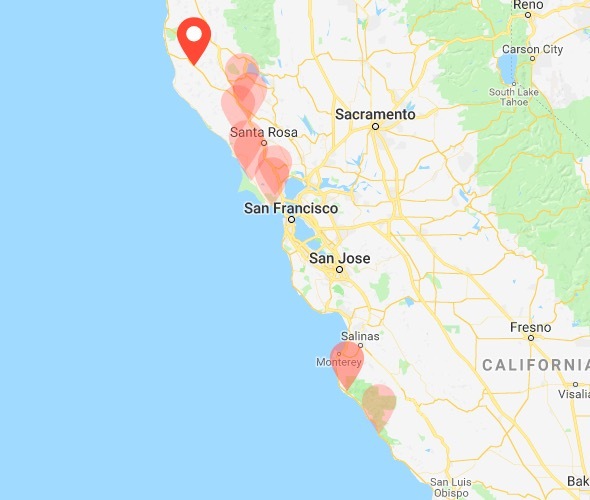 You can pick a spot deep in the woods of the Santa Cruz Mountains or seaside above Stinson Beach. And now that Highway 1 has reopened, Big Sur will be the place to go to get your yurt on. Did we miss one of your favorite spots? Let us know and we’ll be sure to consider it. These three cabins in the heart of Mendocino offer a woody environment and bushels of fresh produce care of the organic garden. After all, they’re smack dab on an apple farm. While this campground’s branding (“Kamping Kabins”) brings to mind an E! reality TV show family of note, these kool spots are great for crashing after a long day of wine tasting. Located near Lake Sonoma and the Russian River, these cabins are close to 50 wineries in the Alexander and Russian River Valleys. It’s also a pet- and child-friendly spot, ideal for families. Amenities include pool, hot tub/sauna, bike rentals, and miniature golf. These wine country dwellings use midcentury design as architectural inspiration. The look is clean with lots of blonde wood, a refreshing break from the dark and rustic look of classic cabins. Each cottage may also include a fireplace, bath, or private patio with hot tub. The property is only two blocks from Healdsburg’s town plaza, should the quiet life prove to much for diehard city folk. Tucked behind a 140-year-old house next to the Russian River, this spot offers 12 cabins offering either a wood-burning fireplace or a wood stove for those cold autumn nights, a kitchenette, ensuite bathroom, and cable television. Another family-friendly spot, this place has a big pool, which might be better used during the semi-warm summer months. More than just one of North Bay’s finest eateries, Nicks Cove also offers 12 cottages atop stilts above the shoreline, replete with wood-burning fireplaces, clawfoot tubs, and choice views. Other amenities include plush down comforters, wood-burning stoves, and bathrooms with heated ceramic tile floors. Located outside the Point Reyes National Seashore just north of the Golden Gate Bridge, this tucked-away lodge has cabins and airstreams offering such amenities as Japanese soaking tubs, dinner delivered to your door in cast-iron pots, and outdoor showers. The 1917 lodge was destroyed in a 2006 fire. Since the owners have restored what remained of Manka’s (the hunting and fishing lodge, two 1900s cabins, and a boathouse on Tomales Bay remain) and added to the property, making it the go-to spot in the area for those in dire need of rest and recharge. Of special note: Prince Charles and Camilla Parker Bowels once stayed here. They’re no Queen Elizabeth II, of course, but it’ll do. 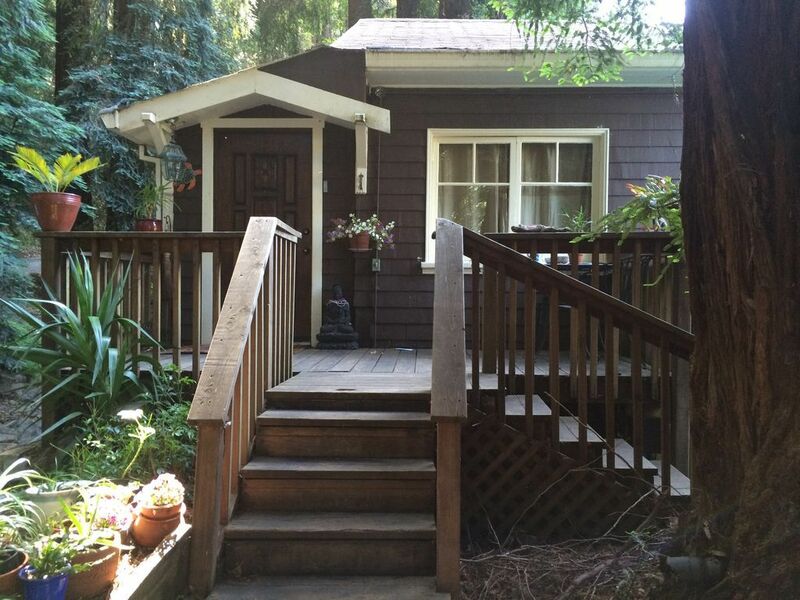 A cozy 1921 cottage is located in a quiet neighborhood underneath 200-foot redwood trees. An idea place for those who enjoy forest bathing! Dwelling comes with fireplace, full bathroom, front deck, and two bedrooms. Just a 10 minute walk to the downtown area. A great spot for hiking and mountain biking trails in nearby Deer Park. There are also five lakes in the area, too. If a lack of luxe amenities is your thing, look no further than these bare-bones cabins along Stinson Beach. Overlooking the Pacific, these humble abodes have no electricity and no water. And people love it. As Sunsetnotes, it’s strongly recommend to reserve a space seven months in advance. Or you can score a last-minute rental via their lottery. No frills but plenty of chill. Located 22 miles south of Carmel-by-the-Sea, Riverside cabins come with queen-size beds, natural wood interiors, and shared or private decks. What this 1957 motor lodge turned eco-retreat lacks in views of the Pacific Ocean, it more than makes up for with soaring redwood trees and lots of privacy. Highlights include cabins with individual patios, outdoor fire pits, heated floors, and spa amenities. According to Sunset, “[T]hey’ve already poached a few guests from high-end Ventana and Post Ranch Inn who’ve realized they can spa and sup there—but save a load by bunking at Glen Oaks instead. Secret’s out. Yurt alert! This Big Sur spot, overlooking the Pacific Ocean, comes with 16 circular shelters, boasting queen-size beds, skylights, and decks. All of them are affordable and ideal for younger campers. But if you want something snazzier (and just who doesn’t? ), check out Treebones Resort’s Autonomous Tent. The cocoon-shaped shelter provides an ample 500 square feet of indoor living space, a king size bed, gas fireplace, and leather lounging chairs. It also comes with an en suite bathroom including a claw foot shower and flushable composting toilet. The tent’s fabric material, stretched across the metal ribs, illuminates at night and provides natural lighting during the day.